A small band of Indian journalists, activists and politicians, all of who parade themselves as “Secularists” continuously malign Narendra Modi as being a symbol of everything bad in the world; to these same individuals Emperor Akbar, the third Mughal emperor of medieval India, is one of the great icons of Indian secularism. If we look objectively at the matter, it can be seen that this is very much a confused position. It scarcely needs mentioning that Narendra Modi’s reputation among this Secular Elite arises from the 2002 Gujarat riots. It was under his Chief Ministership that bloody sectarian riots occurred in which according to official counts, there were 1180 persons killed, of which 254 were Hindu and the rest Muslim. Narendra Modi is accused by his detractors of ordering the state machinery to let Hindus riot for a few days before intervening, attempting to use his influence to allow Hindu perpetrators of violence to escape prosecution or turn a blind eye when servants of his government were doing the same. Narendra Modi denies the accusations, and several court verdicts have gone in his favour. Indeed he has been cleared by all investigations right up to now including the Supreme Courts own investigation who under the direction of the Congress-led UPA ruling government set up a special team of investigators in 2009 to only give the all clear to Modi of all alleged charges in 2011. Mughal emperor Akbar is often hailed as an icon of tolerance. But was he? If we honestly and objectively compare him to Narendra Modi what do we find? A very disturbing picture emerges which is unflattering to say the least. In his early and middle career Emperor Akbar participated in violence which was substantially religiously inspired. Hence the title of ‘ghazi’ which he earned for killing infidels. His atrocities were on a far greater and more direct scale than anything that Narendra Modi can reasonably be accused of. Just a few brief examples shall be cited here to demonstrate the extent of his killings, and also the fact that far into his rule he still did not treat Hindus equally. At the end of the siege of Chittor, Akbar ordered the massacre of 30,000 inhabitants of the felled fort on 24th February 1568, and after this Akbar had the heads of fallen Rajputs displayed upon towers erected throughout the region to show his authority. Abdul Qadir Badaoni who was then one of Akbar’s court chaplains or imams, states that he sought an interview with the emperor when the royal troops were marching against Rana Pratap in 1576, begging leave of absence for “the privilege of joining the campaign to soak his Islamic beard in Hindu infidel blood”. Akbar was so pleased at the expression of allegiance to his person and to the Islamic idea of Jihad that he bestowed a handful of gold coins on Badaoni as a token of his pleasure. Even when Akbar decided to forge matrimonial alliances with Rajput Kings, the same Rajputs were not allowed to dine and pray with him or take Muslim wives. There was no real equality. There was no real tolerance. It was all on sufferance and imperial personal whim, which could be withdrawn at any moment. No constitutional guarantees here and certainly no democracy. The atrocities carried out under the Emperor were the direct result of his own orders. 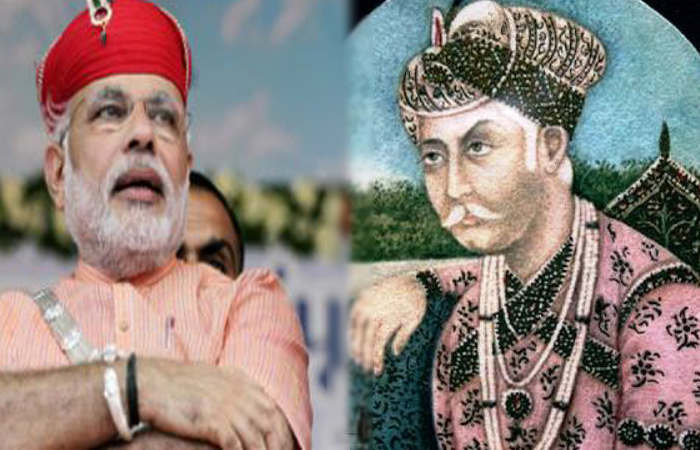 When comparing the crimes against humanity of Emperor Akbar against the unproven allegations against Narendra Modi, one is struck by the sheer hypocrisy of how anybody parading the former as an icon of secularism can charge the latter with having been an affront to India’s long-held tradition of pluralism and mutual respect. Since 2002, Narendra Modi has major positive achievements to his name which have been recognised globally. That is why long before Britain made overtures to him and the USA rescinded its ban on his being allowed a visa, Israel and Latin American countries were beating a path to Gujarat in order to forge links with the man responsible for making his home state the most investment friendly in India. Nobody can seriously question his record on economic growth and governance in his state. He has also tried within certain limits to get away from the “hardline” image. One may take a cynical view of Narendra Modi’s gradual change of image; but the irrefutable fact remains that he has made impressive achievements. This has been combined with governance that is not known for corruption and cronyism. He has also been involved with various campaigns to remove social ills such as Save the Girl Child. Now on the surface there are some parallels with Akbar, who also brought a period of relative peace, stability and prosperity. After a gruesome beginning to his career, Akbar decided to be less cruel and fanatical than his predecessors. However, there is a consensus that this change was triggered by an understanding of the socio-political fabric of India; he realised that by antagonising Hindus, it created uprisings and instability, which are not good for creating a stable prosperous empire and indeed for his rule. Like all medieval Muslim Emperor’s and chieftains of India, he also had Muslim rivals who he knew may revolt from his authority and seek to challenge him. He used his newly forged alliances with certain Rajputs as a counterweight against this threat. Later on, it seems that Akbar genuinely changed. He became interested in learning about all religions, and even tried to create his own religion (the “Din-i-Ilahi”). However in practice this did not equate to equal treatment of Hindus in the kingdom on par with Muslims, and this was not something which Akbar seriously tried to change. Surely the same people who view Akbar as a secular God for his relative tolerance in later life despite knowing that he ordered killings on such a large scale in his earlier career and despite the evidence that religious fervour was involved in the killings, should not be criticising Narendra Modi, especially as his crimes are on a much lesser scale and only alleged. If Akbar can be praised for bringing relative peace, prosperity and stability – surely Narendra Modi can be praised on the same note for bringing progress and good governance in a country in which clean governance is sorely lacking. The only reason why Akbar is praised by India’s secularists as such a paragon of virtue is because of their desperation to find a champion who is not Hindu. Such is there aversion to Hindu culture that if Modi was a non-Hindu then they would be praising his economic achievements and dismiss his alleged crimes. If he left the Hindu fold then overnight they would turn into his staunchest supporters and loyal followers (complete with begging bowl to gain lucrative dead-end jobs as with the rest of India’s state bureaucracy which they have infected). The secularism of India is not the same as that of the West which was born from the need to tame an omnipotent and intolerant church which was wreaking havoc, devastation, wars, slavery and burning women at the stake for being witches. Nothing of the sort prevailed in India. The secularism in India defines itself as being anti-Hindu. That is why ‘secularists’ defend ideas and principles which would be scoffed at in the West and died out with the onset of the modern industrial age. Yet here the so-called ‘progressives’ defend the most obscurantist ideas in the name of ‘tolerance’. This is not tolerance but stupidity and intellectual bankruptcy. That explains why public streets are named after tyrants like Aurangzeb who at the end of his life lamented how he had not managed to forcibly convert all Hindus to Islam. It is also the reason why India’s most prestigious public schools are named after the psychopathic fanatic Francis Xavier who was canonised by the Catholic Church for smashing Hindus shrines, temples and forcing Christianity down India’s throat at the point of the gun. In any other country this would be recognised as obscene. Does Israel name streets and public buildings after Hitler, Himmler and Rudolph Hess? Are the Ku Klux Klan allowed to hold an official cross burning ceremony at the White House on Martin Luther King Day? Gujarat’s prosperity has benefited all sections of its society. What will defeat the anti-Hindu dominance of India’s intellectual life will be the stark reality of the masses building a modern state regardless while the aforementioned chattering classes will become ever more insignificant. In this case the best disinfectant really is sunlight. Note: I am aware of a strenuous campaign to show that Gujarat’s development model is deficient in terms of human development indicators. While I do not wish to say that more could not be done, please click this link to read about how the “poor human development achievement” is actually a manipulation of figures. Ackowledgement: This article was reviewed and edited by Ranbir Singh. The important thing is whether the atrocities and genocide is state sponsored/directed or it happened in rage by the public. Does the state/ administration give an order to massacre of people or has discrimination of people in its constitution or a decree is the question. In Akbar’s case certainly he did order the massacre of the innocent people while raiding upon Chittor. Whether he was young or old, he represents state. He represents king/ kingdom. In all Muslim ruling of the past in India or present elsewhere, where Sharia is implemented, the constitution itself has discrimination of people by birth. That has to be condemned in no uncertain terms. Modi is alleged in atrocity in post Godhra events, but not proven. But certainly there is no state decree to that effect. In Hitler’s case, he recorded and ordered the mass killings by discrimination. But in Mao’s and Stalin’s case it is not recorded of their orders of mass killing. Their operations were covert and is almost proven post their periods. So where lies Modi’s case? He certainly carries the Godhra blot in his career. But how did he react is a question, still making rounds in India. His future career will also prove something hopefully.